Printing SMD · BGA reballing tool Rebcom RBC-1 | Rework & SMT Total solution Provider, Meisho Co.,Ltd. 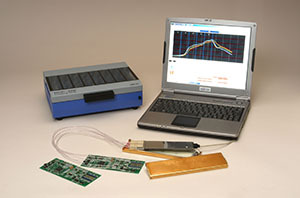 Rebcom is a tool that can easily operate devices printing and reballing without high cost. Rebcom is the patented product. 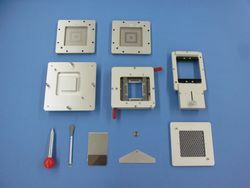 Reballing operation for BGA and CSP was a time-consuming, troublesome, and the operation quality depended on the labor skill. 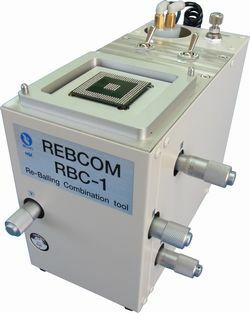 But, you can use this "simple and integrated tool Rebcom, RBC-1 for devices printing and reballing"to operate accurately and keep stable quality. 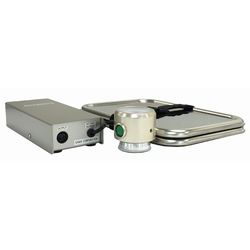 Each tool is also compact design, and the standard accessories include all the standard process needs considering from printing to heating process. 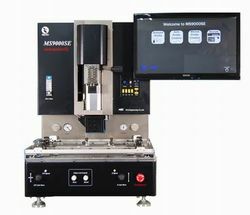 ※ Meisho has demonstration machines, so please feel free to inquire us anytime. 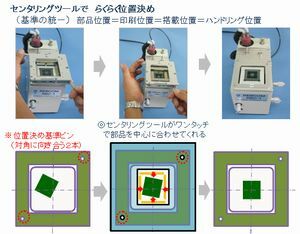 Based on the story that customers had trouble in alignment operations at the time of device printing and reballing, Meisho developed a new mechanism that allows anyone to align devices and PCB with just one touch. By using this mechanism, Meisho made it possible for every user to print devices and reball in the same way. 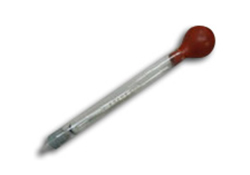 It enables users to reduct various cost by Rebcom RBC- 1. It enables any operators not only to simplify devices alignment and setup change but also to move to the next process (heating), so operators can proceed smoothly to the next process. The conventional jigs needed to prepare for each devices, however, only one Rebcom can apply for various devices. Since what users need is only exchanging the metal mask for printing and reballing, it costs only to make the masks. Moreover, it can meet demands of sudden rework and/or reball without waiting for the delivery date of jig production. When initializing a series of various tools or equipmentsfor printing devices and reballing, the initial cost will also be high, however, it has become possible to offer the Rebcom as a low-cost product by production at Meisho’s own factory. With various standard accessories to the main unit of MS9000SE, it is available as the printing of devices of BGA and/or CSP and reballing, as well as many functions considering the final process such as movement to heating and heating table etc.